Recipe from Farm Girl Gabs, posted with permission. This easy Sweetheart Bark recipe is sure to capture the heart of your Valentine. Pretzels and chocolate. The sweet and salty combination gets me every time. I am a sucker for anything with pretzels and chocolate. I think that is why I like to make pretzel bark. Not only does it satisfy my sweet and salty craving, but it is pretty versatile in the ingredients you can add to it. 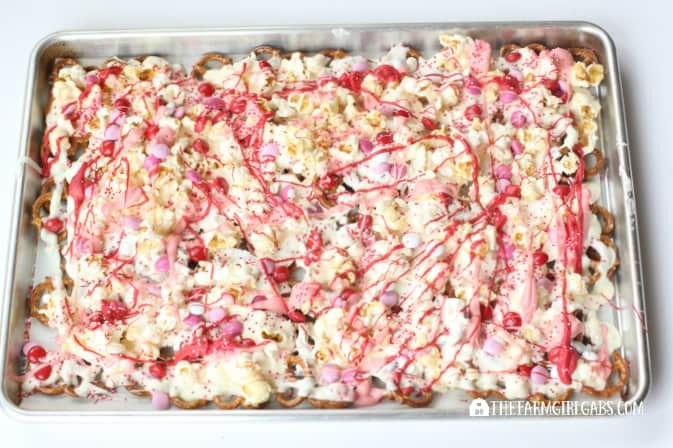 Sweetheart Bark is a perfect Valentine treat to make for class parties, family or friends. I like to think of bark as the kitchen sink of candy. You can basically through whatever ingredients you want into it – dried fruit, assorted candy, nuts – you name it. For some reason, I had an overabundance of Valentine M&M’s®. Don’t ask me how that happened, but I just had to use them up. If not, I would slowly devour each bag, one by one. So, I used them in the recipe…along with some kettle corn, and Valentine Sprinkles. I miss the days when my kids were young. I enjoyed sending treats to school for their class parties. This Sweetheart Bark is the perfect Valentine treat to package in clear cellophane bags and hand out. I love the Valentine colors too. Red and pink happen to be my two favorite colors. Double bonus! This recipe really takes very little effort, even if you are not a fan of baking or cooking. Start by spreading out some pretzels on a parchment-lined baking sheet. I then melted white chocolate, pink candy melts and red candy melts. Pour the white chocolate over the pretzels. Add some popcorn, candy and sprinkles over the bark. I press slightly just so everything sticks to the chocolate. Then, drizzle the melted pink and red candy melts over the entire pan. You can either refrigerate the bark for about one hour or let it set out on the counter to cool. Once cooled, break into pieces. Store in an air-tight container. You can make the pieces as big or small as you like. I am so in love with this fun Valentine’s Day treat. What are some fun desserts you like to make for Valentine’s Day? Line a large baking sheet with parchment paper. Spread pretzels over entire sheet. Melt white chocolate over a double boiler. Add vegetable oil. Melt the candy melts in a microwave for about one minute, 30 seconds at a time. Stir after 30 seconds. Pour white chocolate over pretzels. Top with popcorn, chocolate coated candies and sprinkles. Gently press so ingredients sticks to the white chocolate. Drizzle pink and red melted chocolate over pan. Allow to cool completely on the counter. You can also cool in the refrigerator for one hour. Break into pieces. Store in an air-tight container. Hi there! My name is Melissa and I am the farm girl behind The Farm Girl Gabs®. I’m a Jersey girl, born and bred, married to hard-working farmer Anthony and mom to Gabby – 20 and AJ – 16. Learn more about her on Farm Girl Gabs.